Scale miniature morning glory vines can be easily made from paper, thread and paint. They work well in dollhouse scenes, and can also be used for other scale miniature garden vignettes or cake decorations. If you make them for cakes, you can make the leaves and flowers from fondant instead of paper, and make them full size or miniature, whichever you wish. The technique for making them is the same. If you prefer, you can make them from thin polymer clay or cold porcelain if that is your preferred medium for miniature plants. Thin Paper - I use air mail paper if I can find it, but thinner weights of printer paper will work as well. If you can only find thicker papers you can sometimes separate them into layers to get thinner colored paper. You will need dark green and your choice of color. Watercolor or Acrylic Paints - in your choice of colors to color your flowers, leaves and the centers of your flowers. Watercolor pencils also work well. You will need thick white acrylic paint (tube acrylic) for the flower stalks. Fine Paintbrush - to paint the 'star' centers of the morning glories. Round Punch - For 1:12 scale morning glory flowers you can use a 1/4 inch round punch or hole punch, for 1:24 scale you will need a 1/8 inch punch, and for 1:48 scale you will need a 1:16 inch punch. Sharp Curved Scissors to cut hearts for smaller scales. 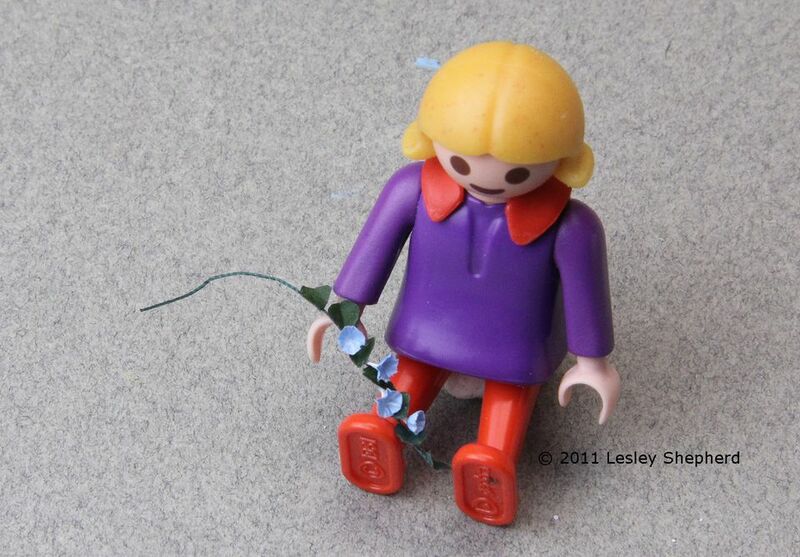 The trick to making miniature morning glories look realistic is to make the long tube like calyx for the flowers. To do this, cut short lengths of dark green thread (3/16 to 1/4 inch long) and dip the ends in some thick white acrylic paint (tube paint). Use tweezers to set the threads into a scrap piece of florists foam or styrofoam if you have some available. You want to have the threads have a small blob of paint at the top of the thread. This will look like the long tube for the flower when you finish the flowers. Do not dip the entire piece of thread in paint. The length of your flower tube should be just slightly longer than the diameter of the circles you punched for your flowers. Leave the ends of the thread as green stems. Use the appropriate size punch for your particular flower scale to cut heart shapes from thin dark green paper for your morning glory vines. The most realistic leaves will be made from dark green painted paper, with a slight gloss finish. To make leaves for tiny 1:48 scale morning glory vines, fold a thin strip of green paper in half lengthwise and use sharp curved scissors to cut half hearts on the fold. Carefully set your cut or punched hearts on a piece of craft foam, a foam mousepad, or an eraser, and use an embossing tool to draw a line down the center of the heart to form a leaf vein. In the photo on this page you can see the hearts being punched from a thick piece of green paper which has been split and opened to make a thinner layer of paper more suitable for 1:24 scale leaves. To make flowers for your miniature morning glory vines, punch paper circles from lightweight colored or white paper. There are a wide range of colors and patterns of morning glories. Most have white bases on the flower. All have a slight star shaped coloration in the center of the flower. When you have punched out the colored circles for your flowers, use a sharp water color pencil, or a colored drawing pen to mark 5 pointed stars on the petals as shown. When the paint (if you use it) for the centers of the flowers is dry, lay the flowers on a foam pad or eraser, and use a fine embossing tool or a round ended toothpick to gently press into the center of the flower to shape it. Set the flowers aside. You will need at least 5 to seven flowers for every length of morning glory vine, more if you make climbing vines for an arbor or trellis. To assemble the flowers for your miniature morning glory vines, dip the ends of your white painted thread barely into some pva glue, or apply pva glue to the painted end of the thread with the tip of a pin. Use tweezers to attach a shaped flower to the white end of each thread, centering the flower over the thickest point of the painted thread. For larger scale flowers you can use fine paper covered wire instead of thread if you wish. You will have some flowers which are fully open, and others which are more closed. This is fine. Set the flower stalks aside to dry while you assemble the vines. To make vines for your miniature morning glories, cut lengths of dark green thread which are the scale equivalent of three or more feet long, plus a bit extra for 'planting'. For 1:4 scale this would give you a length of thread 3/4 inch long, plus an extra 1/4 inch. Take a fine pin and use it to dab three or four tiny dots of glue on the top of your thread, going back from one end. Use tweezers to attach leaves so that the top of the heart is on the thread, and the point of the heart is facing away from the thread at an angle. The leaves can be glued to the thread at different angles, and slightly different spacings. Try to look at real plants or photos of plants to see how close together the leaves are arranged in nature. Glue leaves to several varied lengths of thread, at least 5 to seven lengths of thread per plant. If you want to make climbing morning glories, make some long vines and some shorter ones to attach to your trellis or arbor. Set the lengths of thread with their leaves aside to dry. To finish your miniature morning glory vines, carefully trim your flower stalks so there is a slight length of green thread (1/8 inch or less) below the white base of your flower. Holding the flower with your tweezers, dip the very end of the green thread in glue, and press it onto the thread of your morning glory vine, so the flower faces either down the vine, or slightly off to one side. Try to glue the flowers so that leaves cover the point where the flower stalk joins the vine. Set the vines aside to dry. When your morning glory vines have dried, you can attach them to your arbour, plant them in the ground or a pot, or use them in miniature floral arrangements. To arrange the plants, start by placing your longest stems against your trellis or arbor, or trailing out of your pot. Add slightly shorter vines to the arrangement, finishing with the shortest vines on top. Try to arrange your lengths of vine so they twist across the surface of a pot or trellis, rather than attaching them in straight lines. Each plant should have only one color of flower, unless you are blending several plants together in one area.